The Estate at Moraine farm in Beverly, MA is like a little oasis in the ‘burbs of Boston. Most of the history property is conservation land and it lends beautifully for outdoor weddings. To date, all of my weddings at Moraine Farm have been sunny and warm. There’s a lucky charm over this estate, for sure. When Chrissy and Louie met there was an instant connection. After only a few months of dating, however, he was deployed to Afghanistan for ten and a half months. While they were thousands of miles away from each other, their connection became deeper and the distance brought them closer together. On July 5th they got married on Moraine Farm, a beautiful rustic backdrop for a romantic wedding. Before the ceremony started we walked into the room where Chrissy was getting ready in order to photograph bride prep. 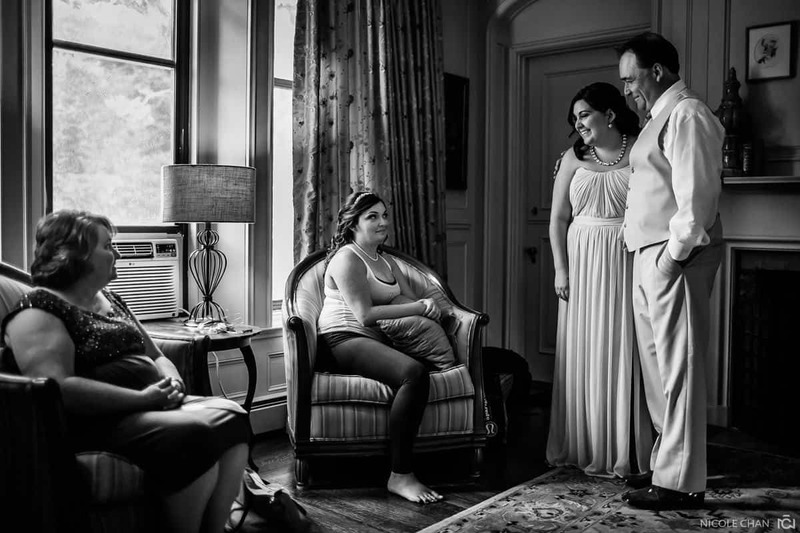 Her mother, sister, and soon to be sister in law helped her into her dress. Her father was never far off though. He kept peeping in the room to make sure Chrissy was okay. After Chrissy and Louis said their “I dos,” and sealed that promise with a kiss, the festivities started in a beautiful tent under the setting sun. The toasts were all heartfelt. You could see the pride in Chrissy’s dad’s eyes as he talked about how excited he was to have Louie join his family. Louie’s younger brother, Cole, brought the humor with his speech, as he mentioned that this wedding must be a pretty important event because his dad got a haircut for it. To top it all off, Chrissy’s brother in law, and also one of Louis best men, couldn’t keep the tears from flowing as he wished the newly married couple success. It was a beautiful day for a beautiful wedding. Congrats Chrissy and Louis!